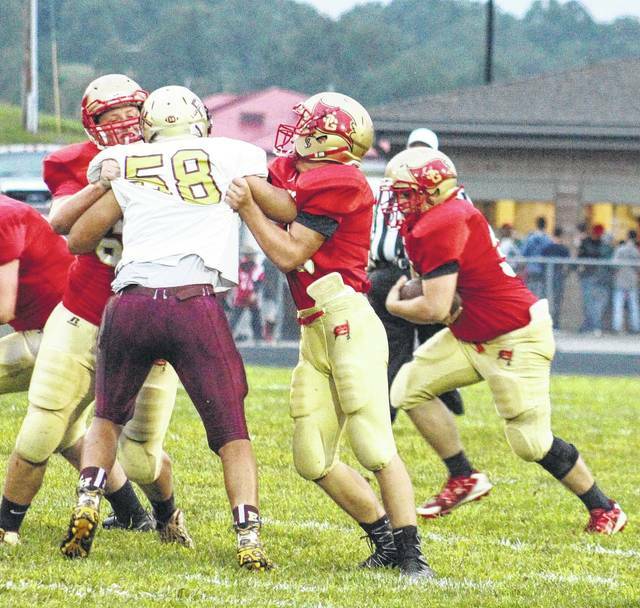 MERCERVILLE, Ohio — A good combination of stingy defense and a power running game. 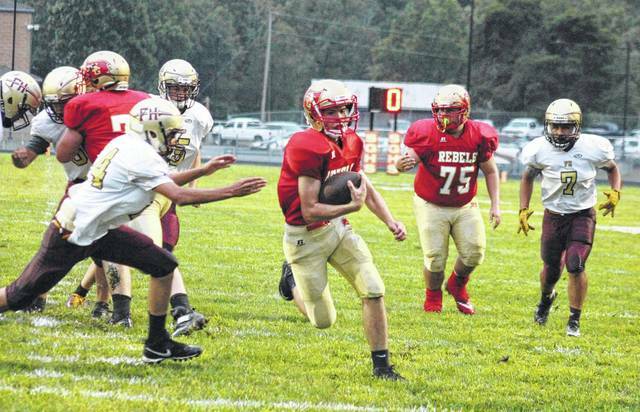 The South Gallia football forced five turnovers, blocked a pair of punts and ran for just shy of 400 yards on Friday night as the host Rebels rolled to a 42-6 victory over Tri-Valley Conference Hocking Division guest Federal Hocking in Gallia County. 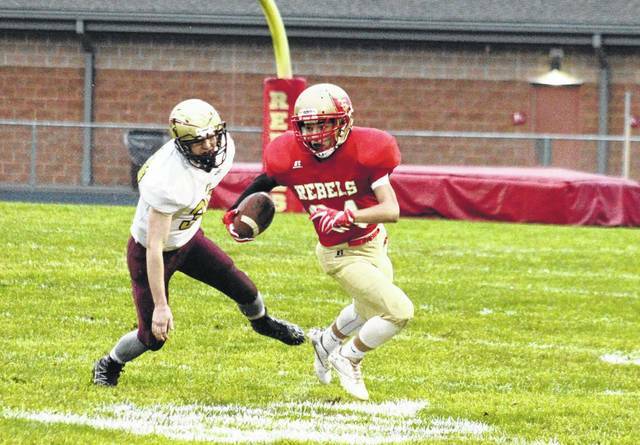 The Rebels (1-1, 1-0 TVC Hocking) — who snap a five-game home losing skid with the win — marched the ball 59 yards for a touchdown on the opening possession of the game. SGHS sophomore quarterback Kyle Northup jetted through the defense from seven yards out with 8:02 left in the first quarter, capping off the seven-play drive that consisted entirely of running plays. Sevat was successful on the point-after kick, giving the hosts a 7-0 lead. Federal Hocking (0-2, 0-1) — which has now lost 23 straight decisions — stumbled out of the gates on offense, as SGHS sophomore Jacob Birtcher intercepted a pass on the Lancers’ second play from scrimmage. After five more Rebel running plays, Northup tossed an 11-yard touchdown pass to Birtcher with 5:33 left in the opening stanza. Sevat added the extra point, giving SGHS a 14-0 lead. After a three-and-out by each side, Federal Hocking’s offense took over at midfield. The Lancers gained a pair of first downs before coming up short on a fourth-and-one, which gave the ball back to the hosts at the SGHS 26. On the fifth play of the Rebel drive, SGHS sophomore Jeffrey Sheets broke a 43-yard touchdown run that, with Sevat’s extra point, gave the hosts a 21-0 advantage with 10:51 to play in the first half. Federal Hocking was picked off on both of its next two possessions, once by Northup and the other by SGHS lineman Austin Day. The Rebels punted for the second and final time of the first half after the first interception, but the hosts didn’t waste their second chance. Three plays after Day’s interception, Sheets found paydirt for the second time in the quarter, this time from two yards out. Sevat added the extra point and gave the hosts a 28-0 lead with 2:52 remaining in the half. The Lancers picked up a pair of first downs on their next drive, but three straight backwards plays ended the half. Federal Hocking received the ball to open the second half, but five plays into the Lancer drive, Birtcher came up with his second interception of the game. The Rebels were forced to punt on the fifth play of their possession, but then the guests went three-and-out. Sheets blocked the Lancer punt, giving the hosts great starting field position at the FHHS 13. However, SGHS fumbled the ball back to the Maroon and Gold on the second play of the drive. The Red and Gold got the ball right back though, as Justin Butler recovered a Federal Hocking fumble on the fourth play of the Lancer possession. On the first play after Butler’s fumble recovery, Sheets broke a 23-yard touchdown run. Sevat added the point-after and gave the hosts a 35-0 advantage with 5:00 left in the third. The Lancers finally got on the board with 1:52 to go in the third, on a third-and-10 from the SGHS 45, when Terrell Mayle caught a pass from Hunter Smith and rumbled into the end zone. The FHHS two-point attempt failed and the guest trailed 35-6 with 1:52 left in the third. On the ensuing possession, the Rebels fumbled away possession on their first play from scrimmage. However, the Lancers were forced to punt and Sheets found his way through the FHHS line again, blocking another punt. On the first play of the final quarter, Northup ran in a six-yard touchdown and Sevat added the extra point — putting the finishing touches on the Rebels’ 42-6 victory. The Rebels held a 16-13 advantage in first downs and claimed the total offense battle by a 408-123 count. SGHS rushed for 397 of its yards, while backing the Lancers up 41 yards on the ground. South Gallia was penalized nine times for a total of 100 yards, while Federal Hocking drew four flags for a total of 15 yards. 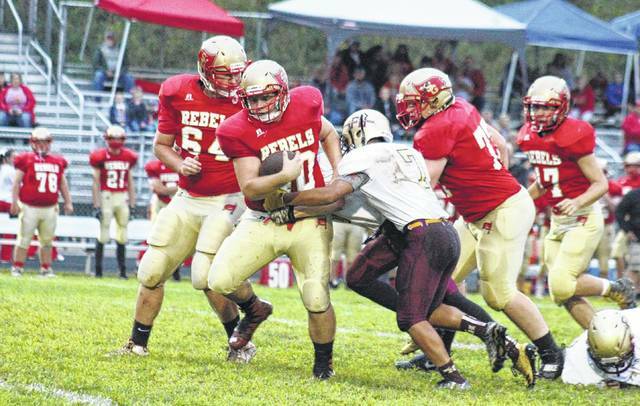 Sheets led the Rebel offense with 210 yards and three touchdowns on 16 carries. Tony Long was next with 76 yards on 10 carries, followed by Kyle Northup with 74 yards and two touchdowns on 11 carries. Gavin Bevan toted the ball for 17 total yards, Chayce Pearson added nine yards, while Bryceton Folden had six and Jaxin Mabe chipped in with five. Northup was 1-of-4 passing for 11 yards, with one touchdown and zero interceptions. Birtcher was the only Rebel to catch a pass, hauling in the 11-yard touchdown. Branden Gould was Federal Hocking’s only positive rusher in the game, going nine total yards on four carries. Smith was 12-of-35 passing with one touchdown and four interceptions for the Lancers. Gould on five receptions and Mayle on two grabs led Federal Hocking with 60 yards apiece in the receiving game. Adam Douglas caught two passes for 20 yards, Alex Fripo hauled in one pass for 16 yards, while Jaedon Walraven had one eight-yard reception. The Rebels have now won six straight over Federal Hocking, giving SGHS a 7-1 edge in the all-time series. The Rebels will have a tough test in front of them as they visit Trimble (1-1) on Friday. Federal Hocking returns to Stewart for a matchup with Belpre (0-2) in Week 3. South Gallia’s Bryceton Folden (right) runs away from Federal Hocking’s Branden Gould (left) during the Rebels’ 42-6 win, on Friday in Mercerville.